Television Committee Room at the GRAMMY Awards. 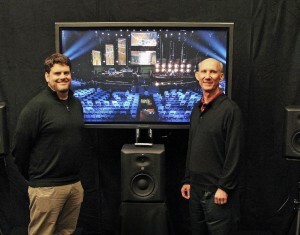 NORTHRIDGE, California – HARMAN’s JBL loudspeakers were at the heart of Sunday’s 55th Annual GRAMMY® Awards, with JBL VTX line arrays comprising the live sound reinforcement system at the STAPLES Center and an LSR6300 Series 5.1 surround sound studio monitor system used in the Television Committee Room. The annual GRAMMY Awards telecast, known as Music’s Biggest Night®, is presented by The Recording Academy® to honor outstanding achievements in the production and performance of recorded music. The GRAMMY Awards were broadcast live in HDTV and 5.1 surround sound on the CBS Television Network. More than 28.1 million people watched this year’s Awards telecast, the second-largest audience for the GRAMMY Awards since 1993. This year’s Awards were hosted by LL Cool J and featured performances by The Black Keys, Mumford & Sons, Rihanna, Taylor Swift, among others. The rock band fun. earned Best New Artist and Song of the Year for “We Are Young,” while Gotye won Record of the Year for “Somebody That I Used to Know,” along with two other GRAMMY Awards. Mumford & Sons earned Album of the Year for Babel. ATK Audiotek supplied the live sound reinforcement system for the Awards, which featured left-right columns of 12 VTX V25 fullsize line array elements per side for the main PA, with additional left-right columns of 12 V25 per side for out fill, along with a center cluster of 18 VTX S28 arrayable subwoofers in cardioid mode (two arrays of nine S28 subs each), for a total of 66 VTX loudspeakers. Six VRX932 Constant Curvature loudspeakers served as front fill, with left-right rear delay arrays of eight VERTEC® VT4889 fullsize line array elements each. Powering the loudspeakers were 16 Crown Audio VRack 12000HD and four VRack 4x3500HD and the entire system was configured using JBL HiQnet Performance Manager™ software. The house sound system at the STAPLES Center, featuring VERTEC VT4888ADP-DA powered line array elements, was used to supplement the live sound system with five enclosures from the center end array used for rear upper deck and VIP box coverage.